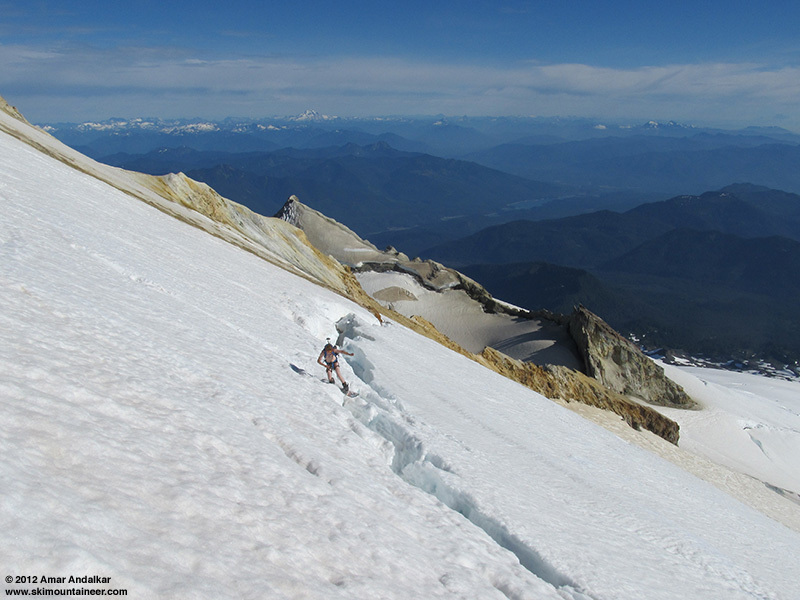 Went back to ski Baker again with Kyle Miller just 5 days after my previous trip (August 15, 2012, Mt Baker, Squak Still Spectacular), deciding to head up the Easton Glacier this time for variety. 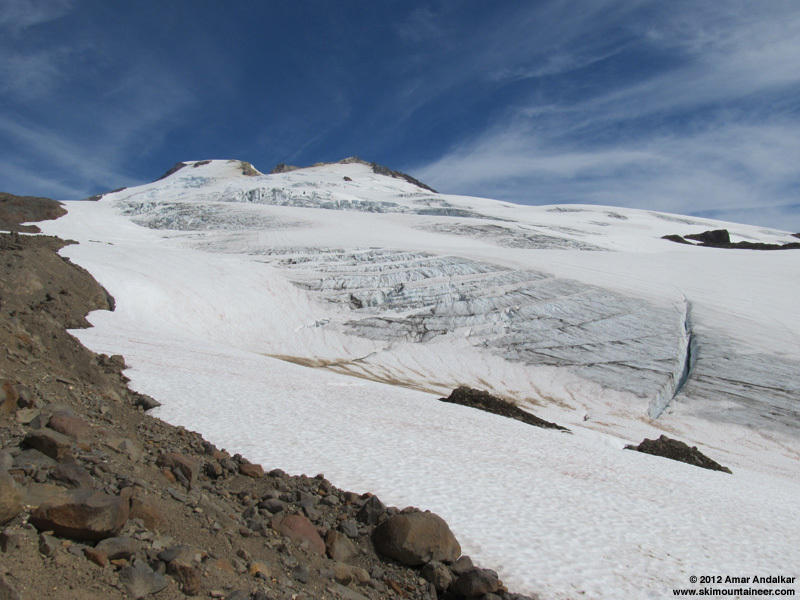 The snow finger below the Easton Glacier terminus has almost entirely melted out in the last 4 days, continuous skiable snow extends down only to about 5800 ft now. As you come up the Railroad Grade trail, skinnable snow starts at the usual spot at 5900 ft just east of Sandy Camp, 4 miles from the trailhead. Lots of crevasses to weave around on the Easton, but the route is in pretty good shape, especially so for late August. The current route does not go through the crevasse slalom shown in the August 16 Easton TR, we never saw that. The crux crevasse areas are from 8700-9400 ft, but there are crevasses to cross all the way down to where you start skinning at 5900 ft. The Easton is definitely more crevassed than the Squak route right now. The route up the Roman Wall is much better than it was 5 days ago (for now). 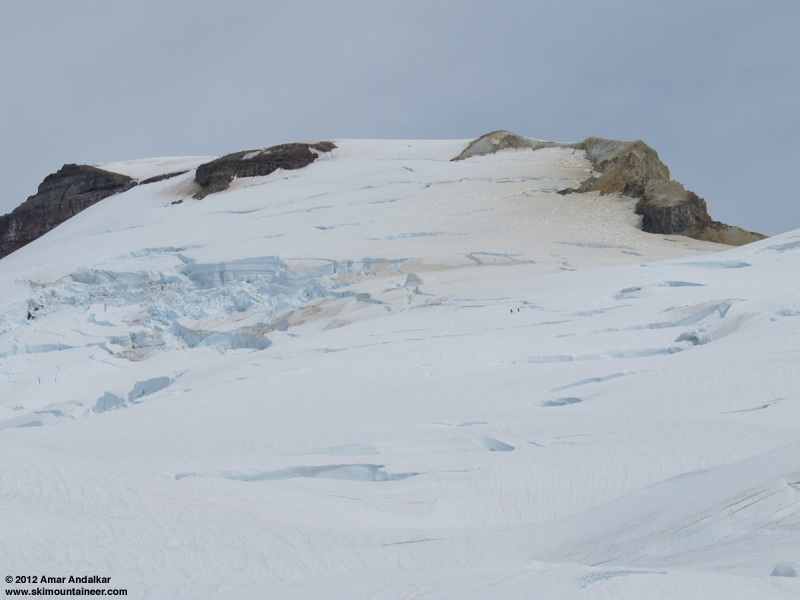 It has been partially rerouted to a much safer position, avoiding the very scary crevasse near 10300 ft that I almost fell into on August 15 (see TR) by staying well to its left. Above that, the route now follows a couple of the end-runs that Juya and I initiated on the 15th. Ski conditions on both the Easton and Squak remain excellent, mostly smooth corn, well-consolidated and not sticky even in late afternoon. The snow is slightly rougher than a few days ago. We decided to ski the Squak since it offered more skiable vertical and a shorter exit hike. The glacial stream gully west of Crag View has melted out very rapidly in a few spots below 5600 ft, more than I expected. I still skied down to the same spot at 5150 ft as on August 15, but needed 3 medium-length carries across bare ground near 5600, 5400, and 5200 ft to do so. Overall, it was just another outstanding August ski day on the Great White Watcher, still offering about 5500 vert of mostly great skiing for about 7600 ft of total gain this day. Might have to go ski it a couple more times this month, or maybe on September 1. 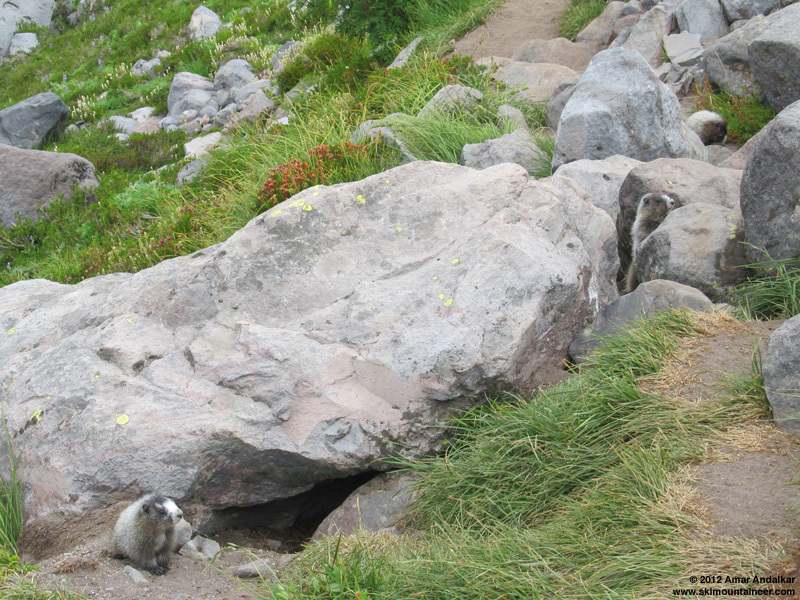 We saw 3 marmot babies coming out of their den under a large rock near 5400 ft, right in the middle of the Railroad Grade trail. They allowed us to approach within a few feet. 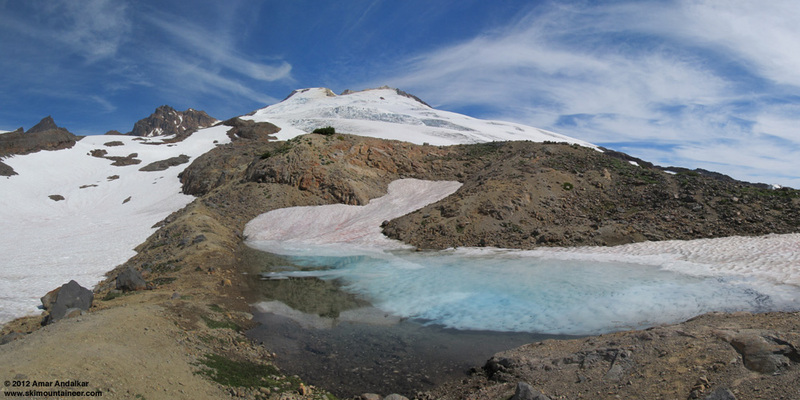 Four-shot panorama (vertical camera) of Mount Baker reflected in a small icy pond near 5900 ft. The Easton Glacier from 5900 ft where we started skinning. 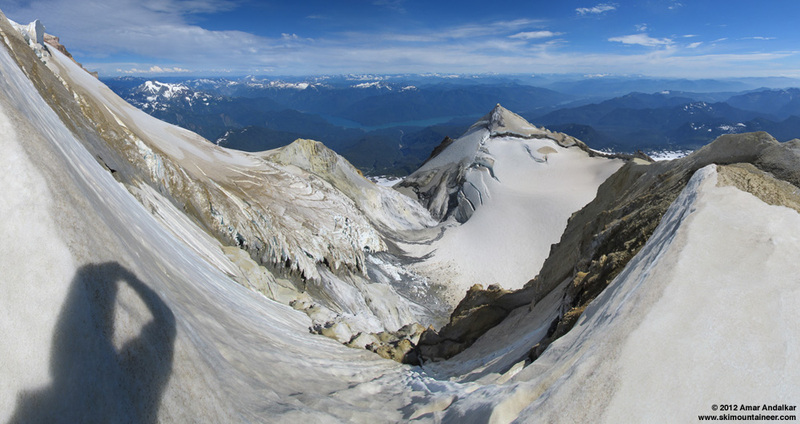 Two-shot panorama looking across at a huge jumble of seracs near 6500 ft on the Easton Glacier, with Glacier Peak in the distance. Zoomed view looking up from 7400 ft towards the crux crevasse areas of the Easton and the Roman Wall. The 2 descending climbers are at about 8800 ft.
Twelve-shot panorama (vertical camera, 6x2 grid, I'm shocked that it stitched so nicely) looking down into Sherman Crater from near 10500 ft on the edge of the Roman Wall. Kyle riding across a crevasse high on the Roman Wall. LOST SHOES at 9600 ft: We carried our shoes up from where we started skinning since we were planning to ski down the Squak instead, and I left mine at 9600 ft beside the bootpack when we roped up and put the skis on the pack (save 2 lbs of weight, right?). Planned to pick to them up on the way down, but skied a bit too far to the right of the bootpack following the smooth snow and so I didn't ski past them. Did not realize I had forgotten to pick them up until all the way down to 5600 ft, there was no way at that point to go back up 4000 vert to get them. The 3.3 mile hike out in ski boots was actually not too bad, only moderately painful, I'm glad my Garmont MegaRides are so comfortable for me (my 3rd pair since 2005, over 470 days total on them). If anyone goes up there in the next few days and the shoes are still there, I would appreciate it if you could retrieve them. They are black Montrail mid-height hiking shoes, heavily-worn and with no remaining monetary value -- they only cost $89 on sale 2 years ago, and I also have a second pair, still new in box. But I'd prefer not to leave trash on the mountain, so I'd be happy to buy a couple six-packs of your choice (or comparable small reward) for anyone who retrieves them. I've also checked online to see if any of the 5 authorized guide services have scheduled Easton climbs through this weekend, but none appear to. I may go back in a few days to ski Baker again anyway, so maybe the shoes will still be there otherwise. I haven't skied August yet.I would like to ski a different route. Do you have any beta for the drive to the trailhead. Hey Amar - don't bank on it.� I left my gloves on a rock after skiing Avalanche Glacier headwall a few years ago if you recall.� Went back with Ian a couple of days later and they were gone.� We stopped in an area that was way out of the way for people(as it was to take some pics), so we assumed a goat took them.� Granted your shoes are pretty high up on the mountain, but it's possible a goat (or other animal), may have an appetite to chew on some leather.� Good luck tho. No.� Kyle's clothing choices were made on the summit despite my strong objections. At least he was wearing his climbing harness. At least he was wearing his climbing harness. Three-packs of baby marmots rule. Always. For each layer Amar wears off the summit, we take one off. Looks like it was colder than expected on this trip because Kyle really had to strip down. UPDATE: FOUND SHOES! 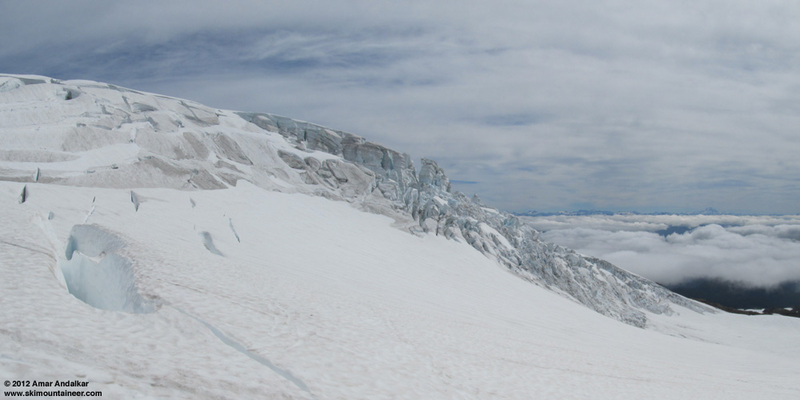 I went back up to ski Mount Baker again and retrieve my lost shoes 5 days later, see August 25, 2012, Mt Baker, Easton & Squak Glaciers. Somewhat surprisingly, the shoes were still at 9600 ft where I had left them, someone (or something) had moved them a few feet apart, but they were otherwise undamaged and still appear to have some life left in them, more than I thought they did. Despite two years of heavy summer use, the soles are still in good shape and they are still waterproof in a 1-minute 3" deep bucket test, so it looks like I'll get some more good use out of them before they're done.